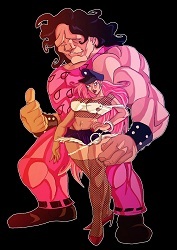 Hugo and Poison Kiss are often portraited together, in the Street Fighter III and SNK Vs Capcom games, Posion always accompanied Hugo to the fights. Both characters started in the Final Fight series as enemies of the good guys. 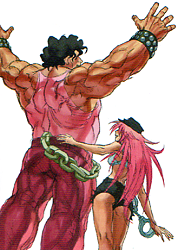 Poison was till now just one time playable, in the Sega Saturn fighting game Final Fight Revenge.